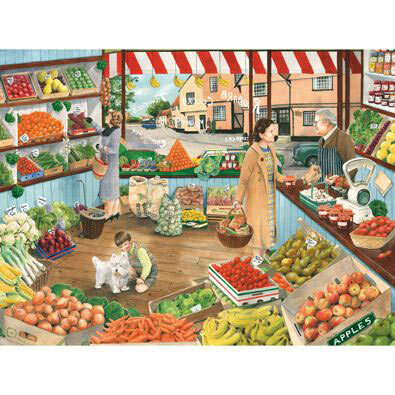 Green Grocers is a 500 Piece Jigsaw Puzzle designed by Tracy Hall. This small shop is bursting with fruits and vegetables of every kind. The day is as fresh as the produce as a mother runs errands with her son and their dog, making pleasant conversation with the grocer. • This jigsaw puzzle measures 18" x 24"
This 500 piece jigsaw is designed by Tracy Hall and measures 18" x 24". Available in two piece counts. This 500-piece jigsaw is designed by Tracy Hall and measures 18" x 24". This puzzle depicts a busy village shop. People can buy groceries at one both and check their savings at another.